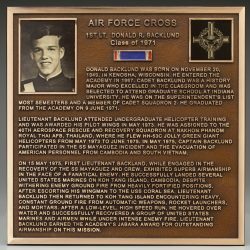 These 7 bronze plaques, designed and cast, by Sculptor James Nance measure 20 inches by 20 inches and represent the seven highest Combat valor awards of the USAF. 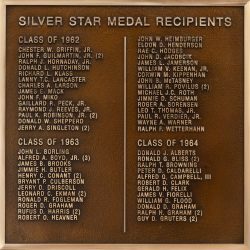 They are displayed in the Plaza of Heroes at the Vietnam Memorial Pavilion, USAF Academy, Colorado. 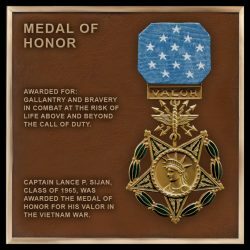 “Medal of Honor” bronze plaque designed and cast by Sculptor James Nance. 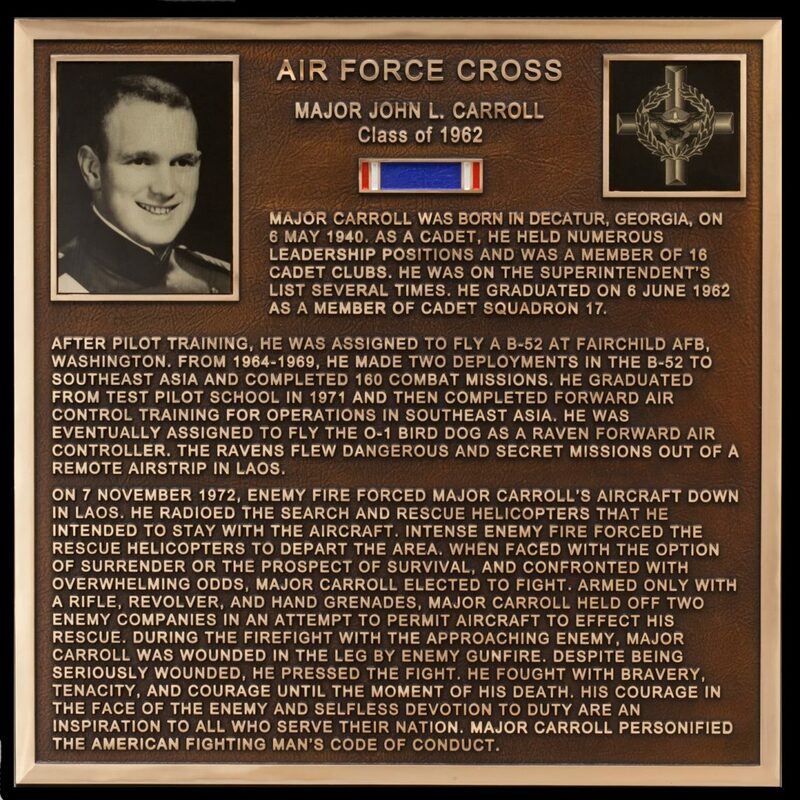 Awarded for: Gallantry and bravery in combat at the risk of life above and beyond the call of duty. 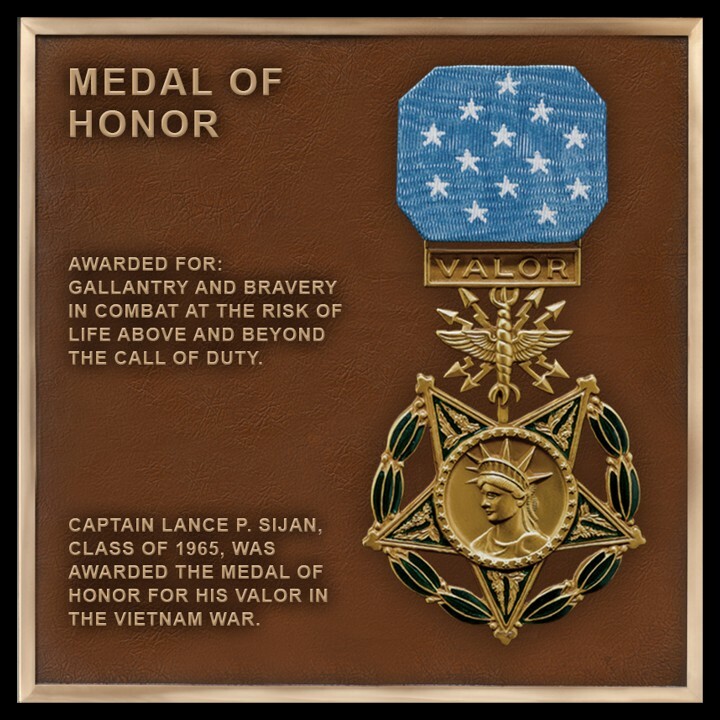 Captain Lance P. Sijan, class of 1965 was awarded the Medal of Honor for his valor in the Vietnam war. 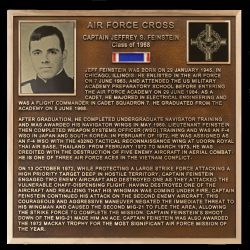 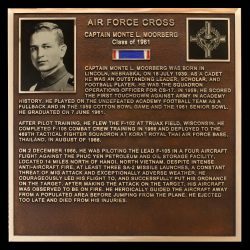 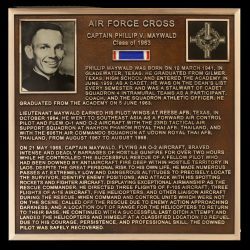 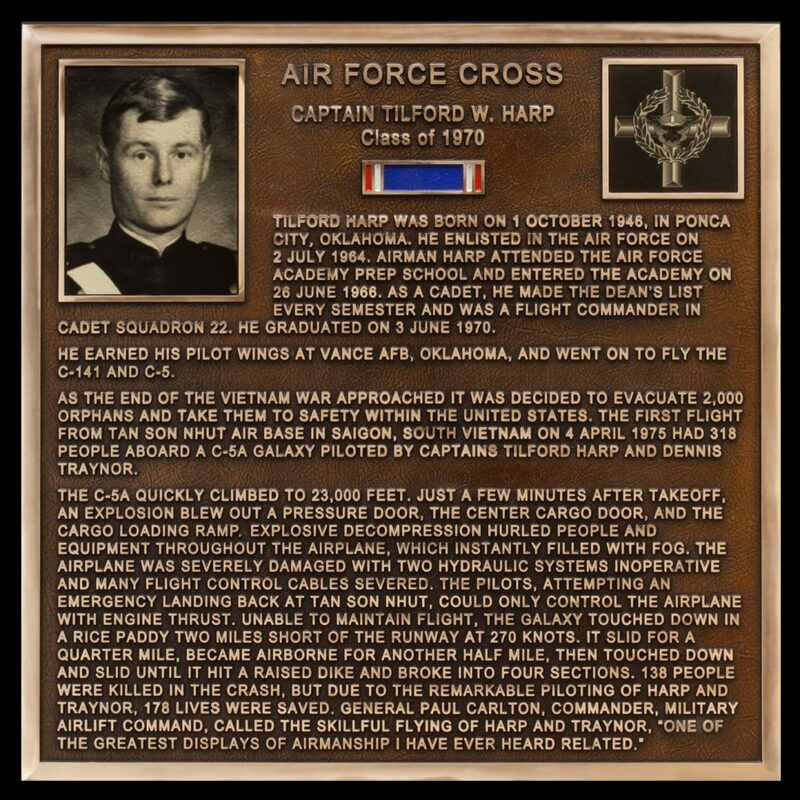 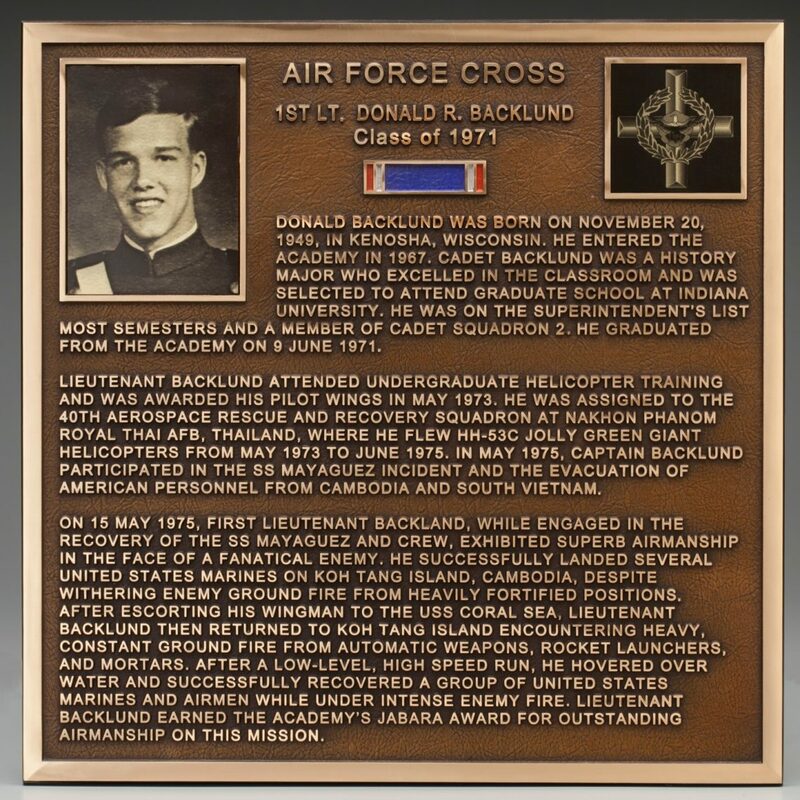 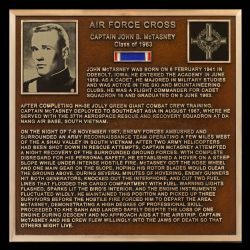 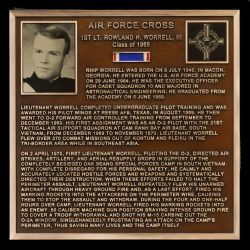 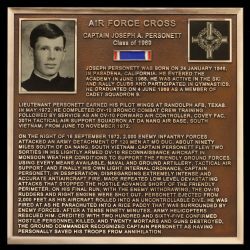 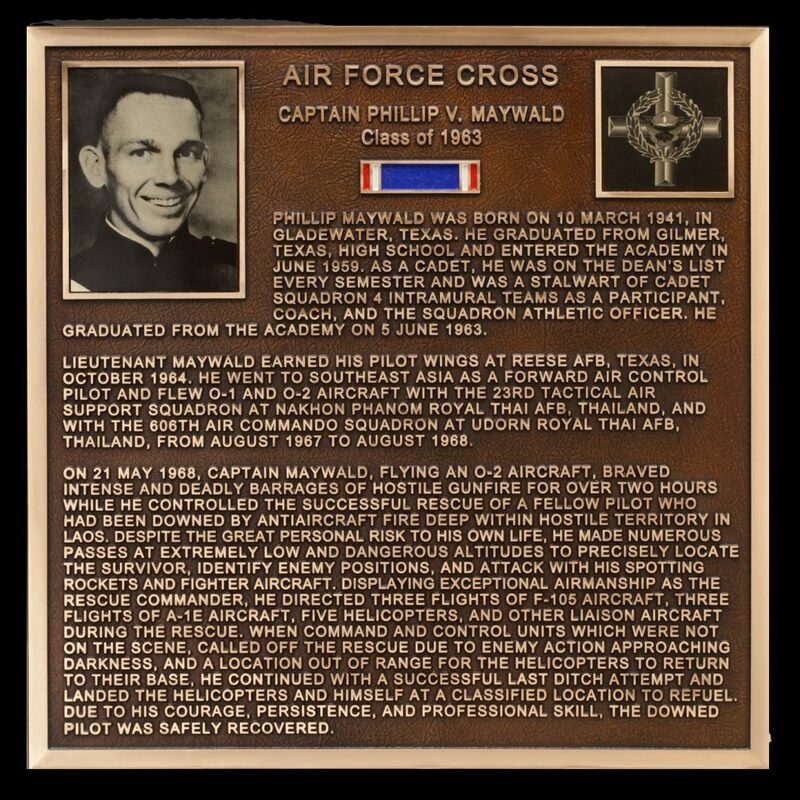 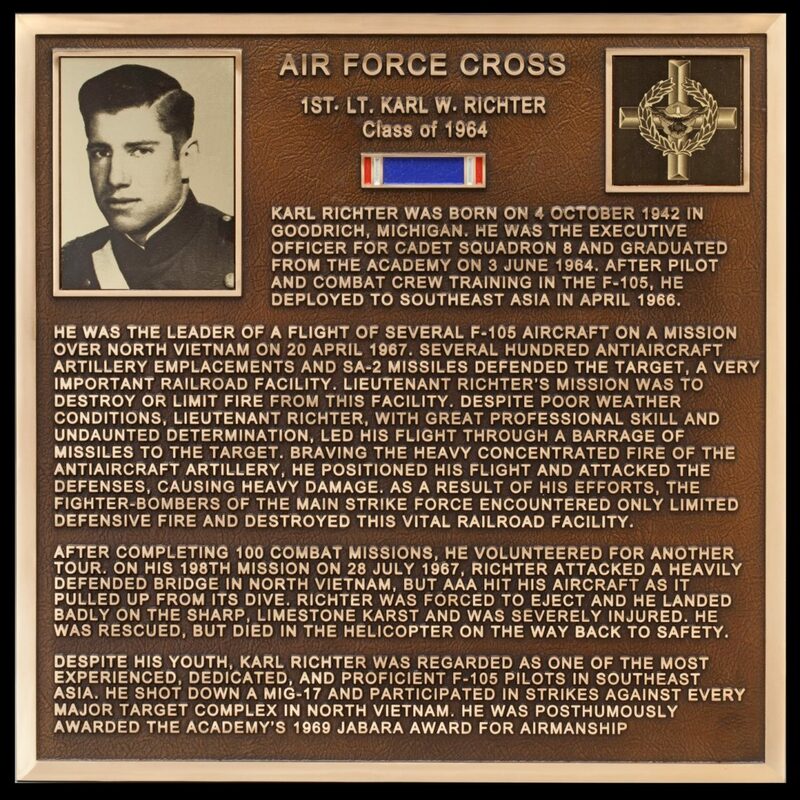 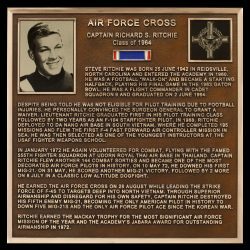 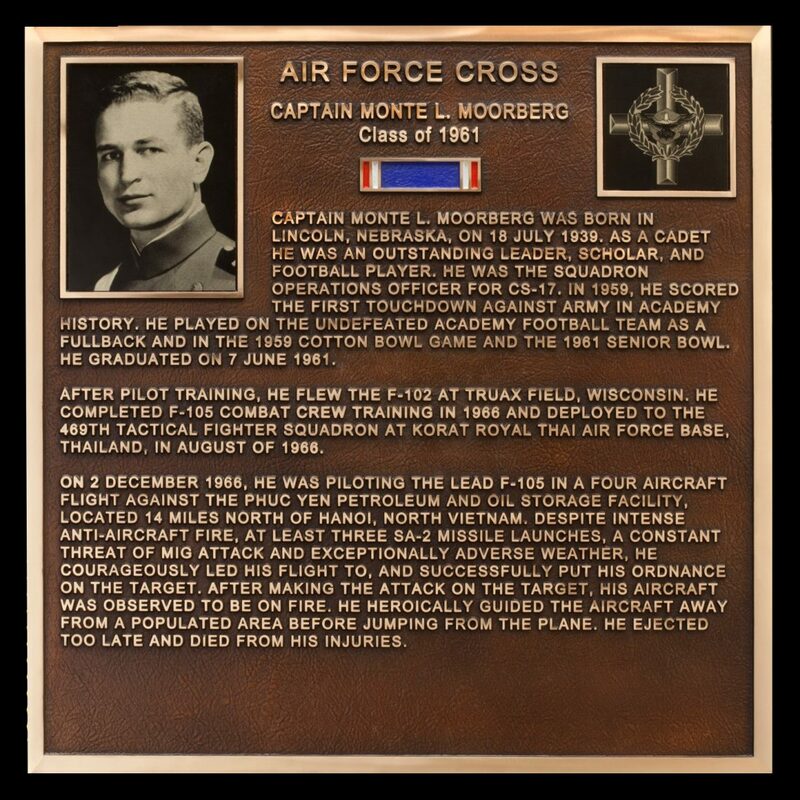 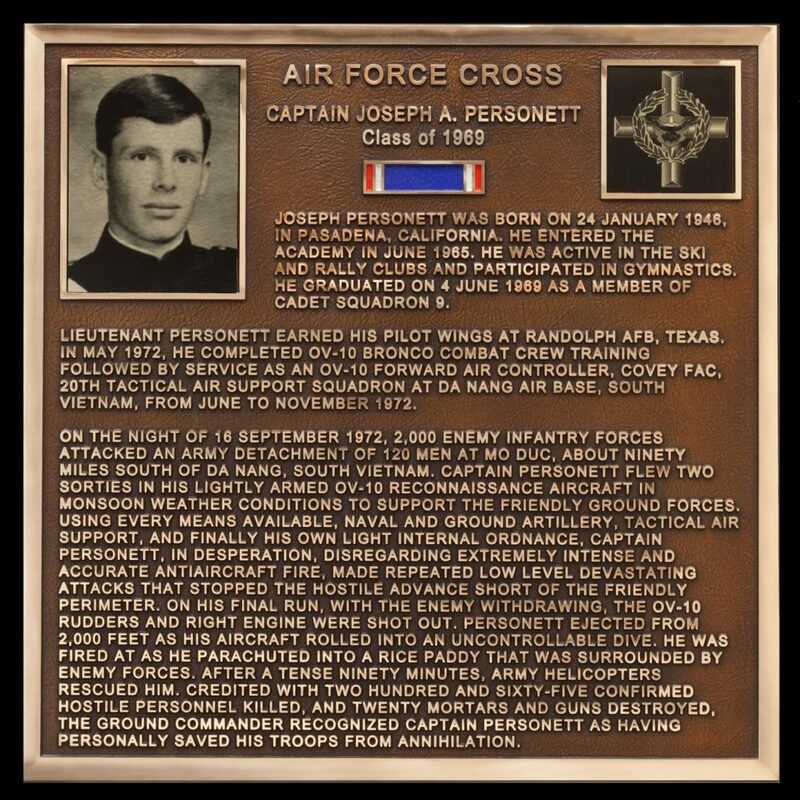 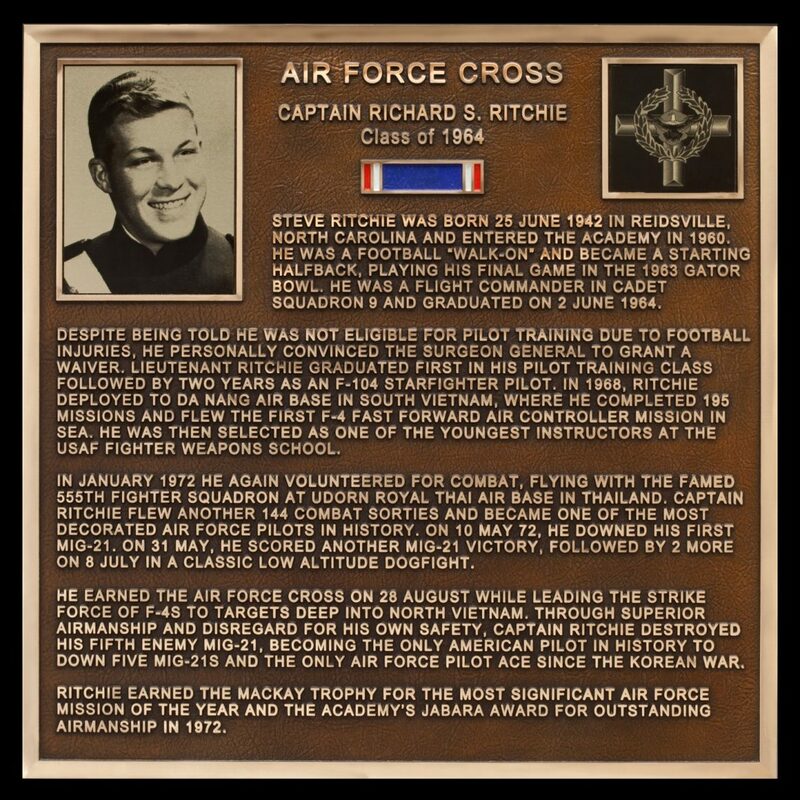 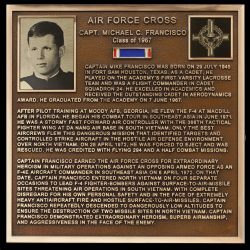 “Air Force Cross” bronze plaque designed and cast by Sculptor James Nance. 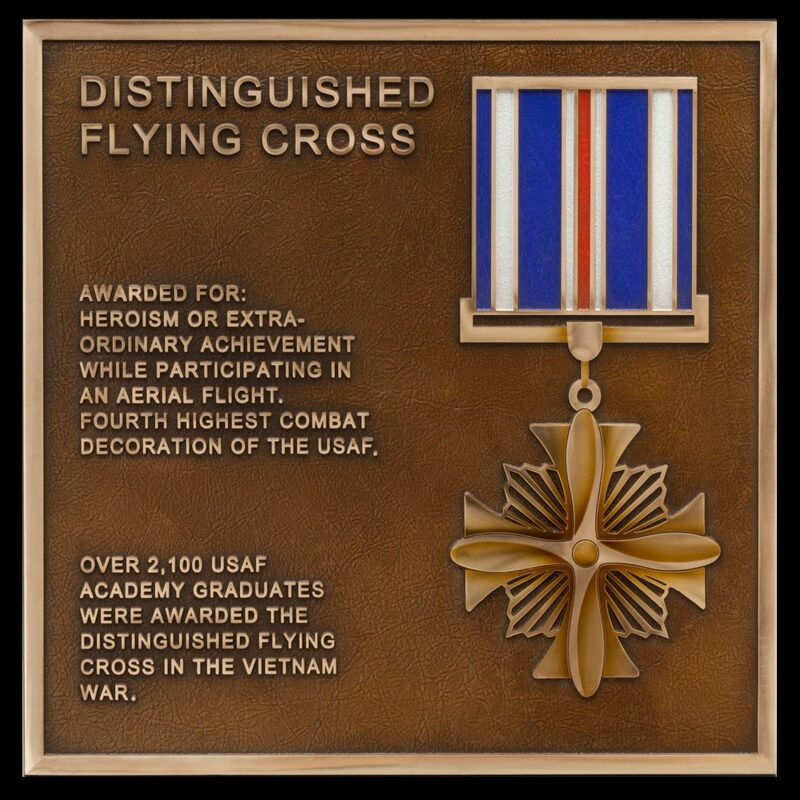 Awarded for: Extraordinary heroism while engaged in an action against an enemy of the United States. 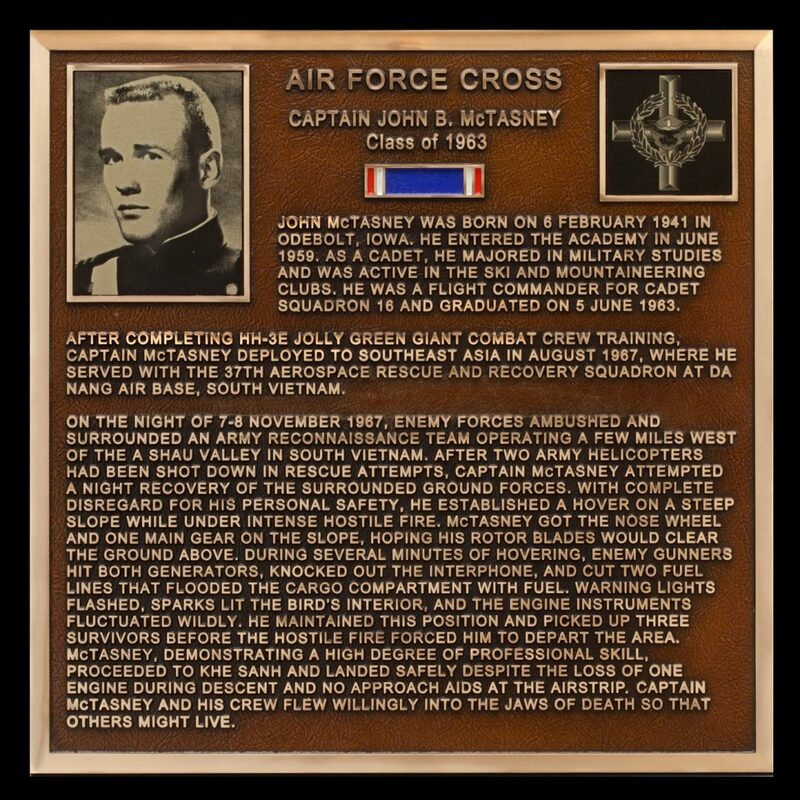 Highest medal of the USAF after the Medal of Honor. 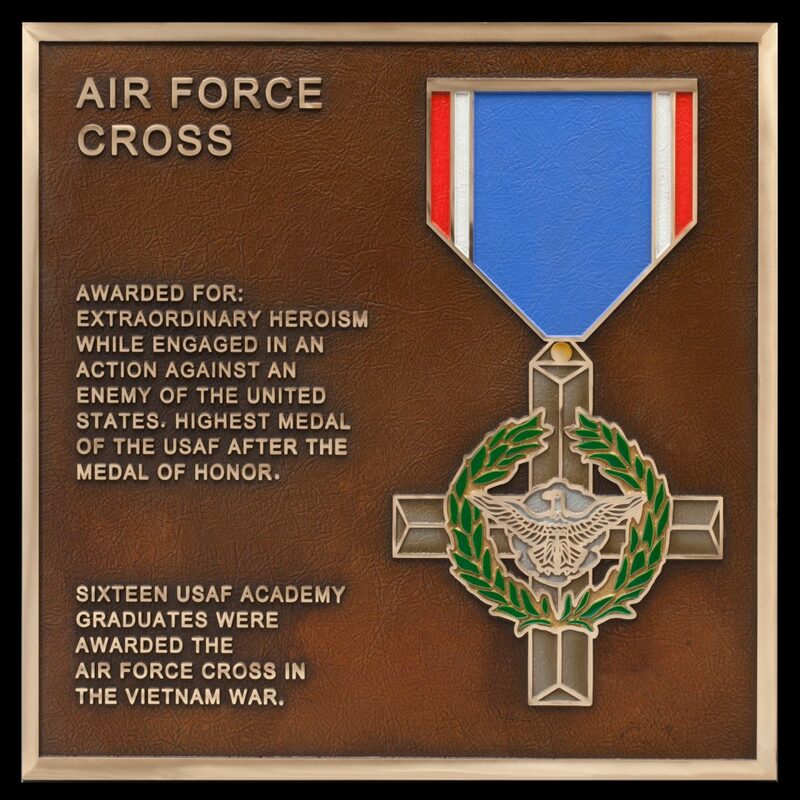 Sixteen USAF Academy graduates were awarded the Air Force Cross in the Vietnam war. 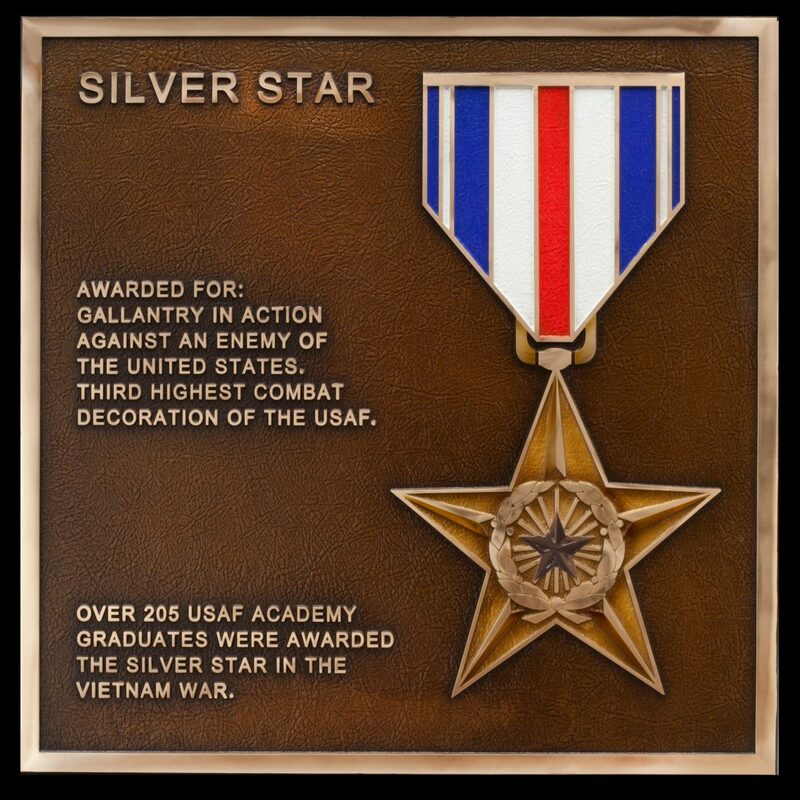 “Silver Star” bronze plaque, designed and cast by sculptor James Nance. 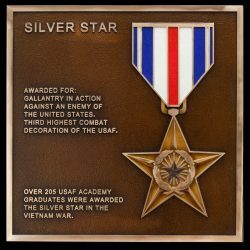 Awarded for: Gallantry in action against an enemy of the United States. 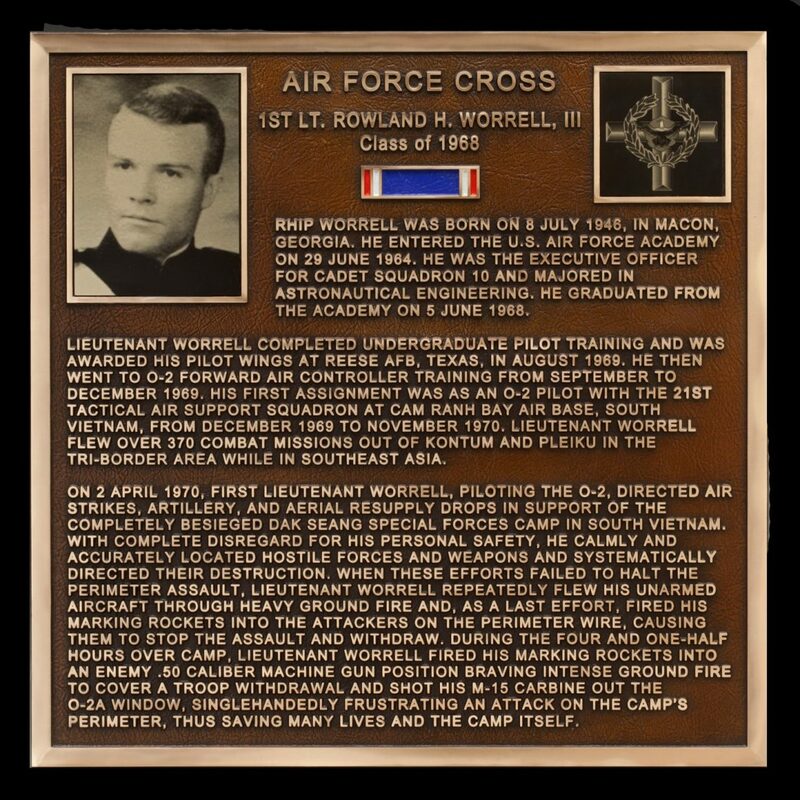 Third highest combat decoration of the USAF. 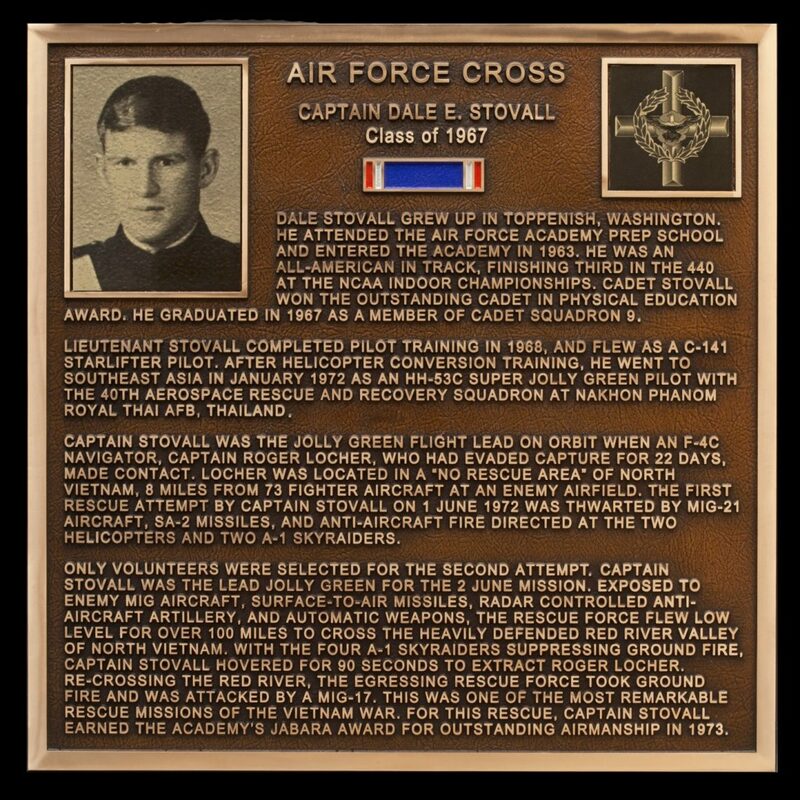 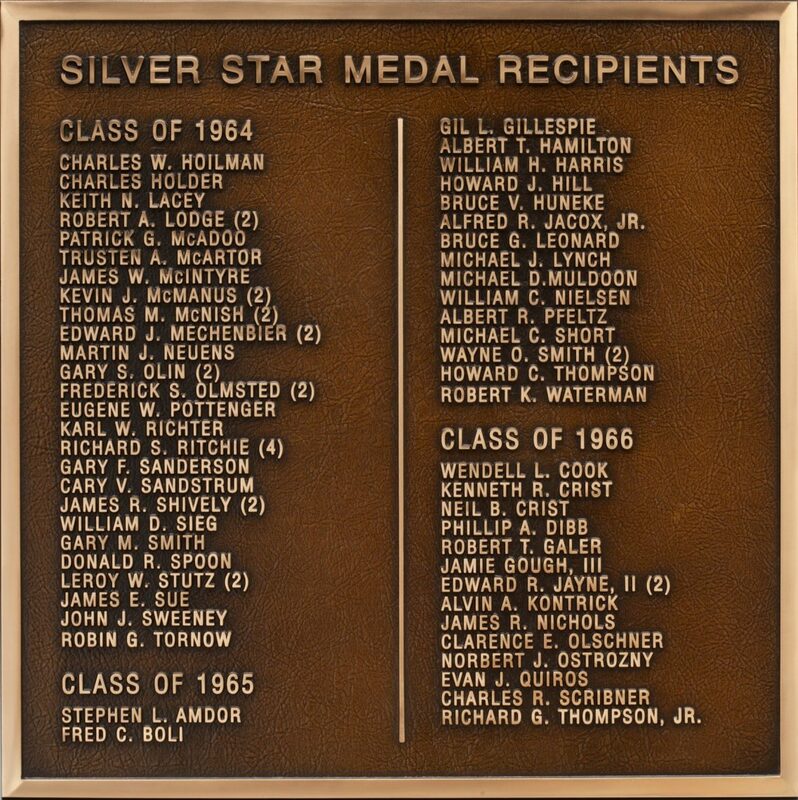 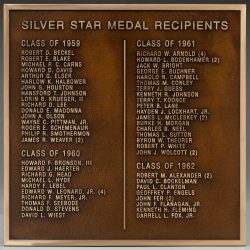 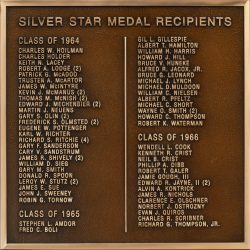 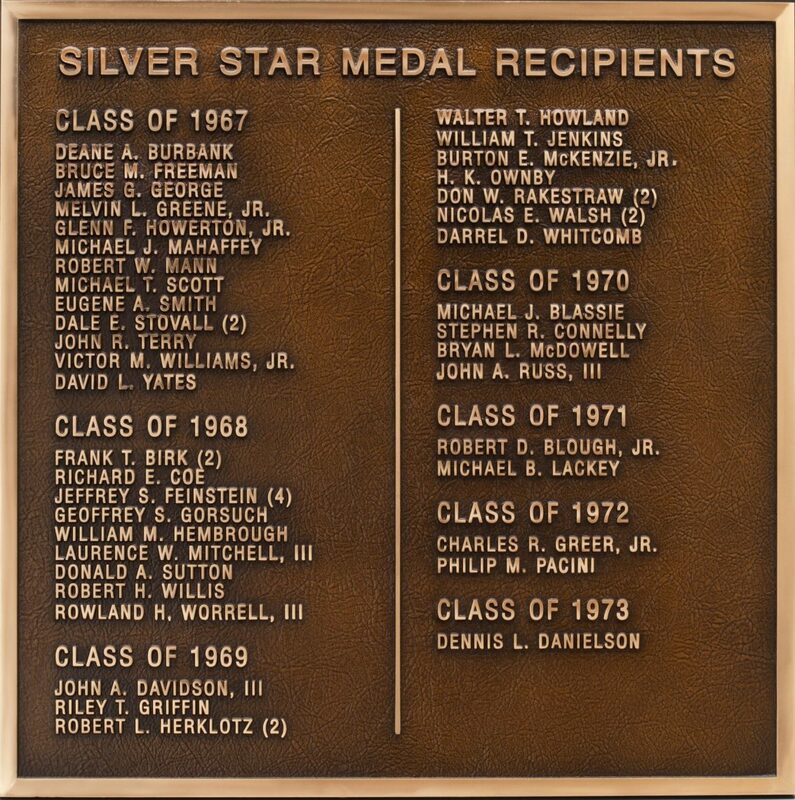 205 USAF Academy graduates were awarded the Silver Star in the Vietnam war. 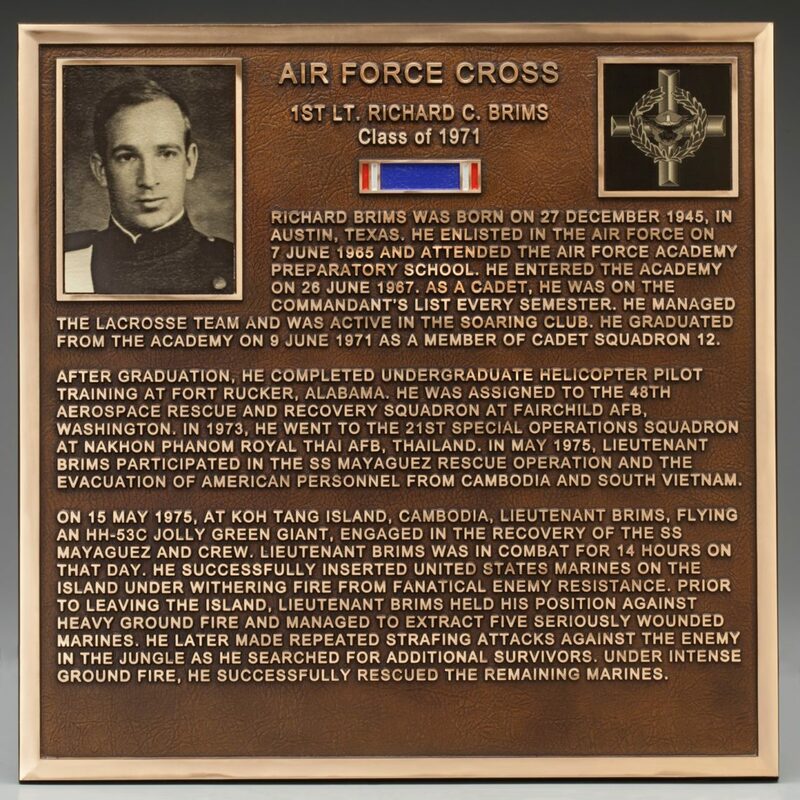 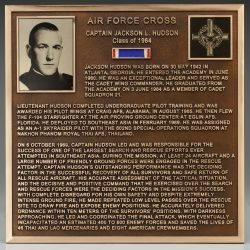 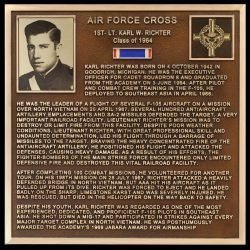 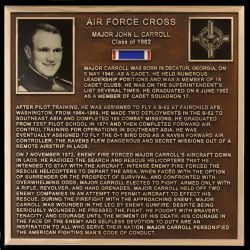 “Distinguished Flying Cross” bronze plaque, designed and cast by sculptor James Nance. 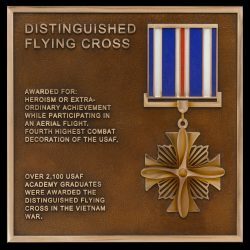 Awarded for: Heroism or extraordinary achievement while participating in aerial flight. 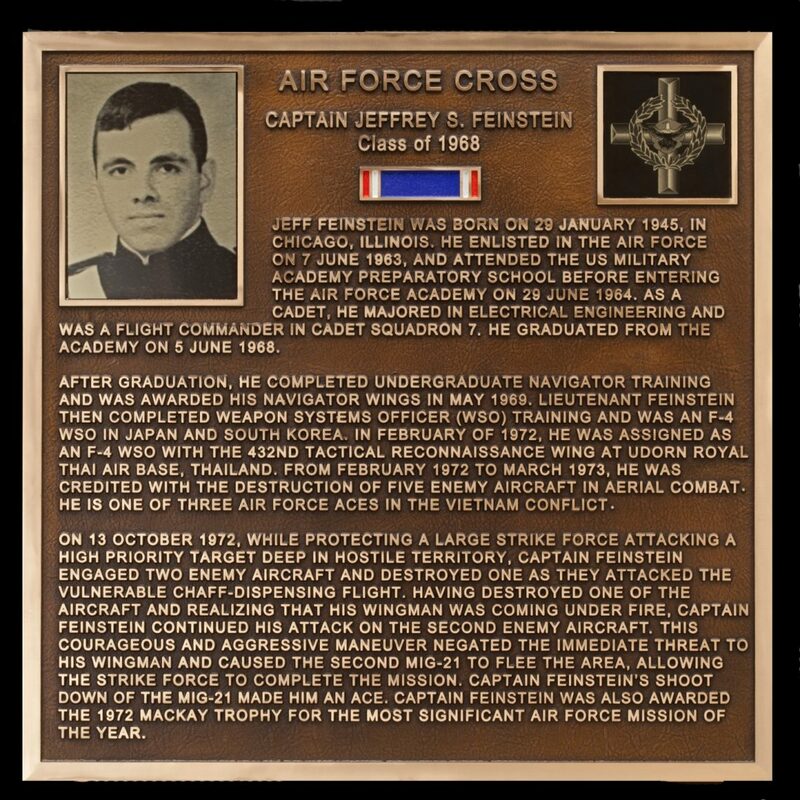 Fourth highest combat decoration of the USAF. 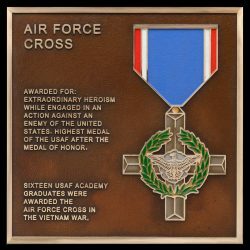 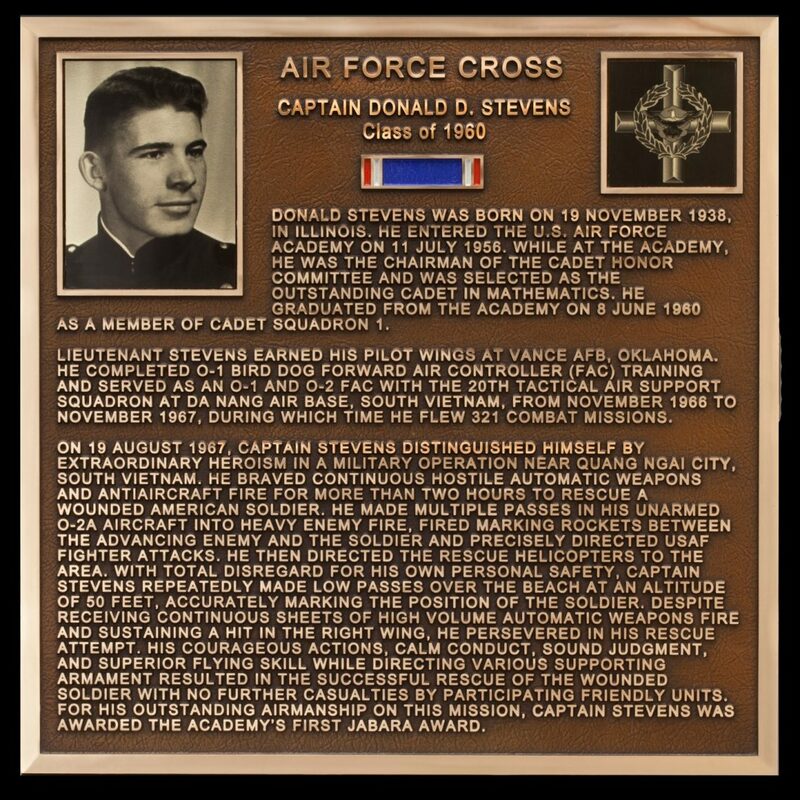 Over 2,100 USAF Academy graduates were awarded the Distinguished Flying Cross in the Vietnam war. 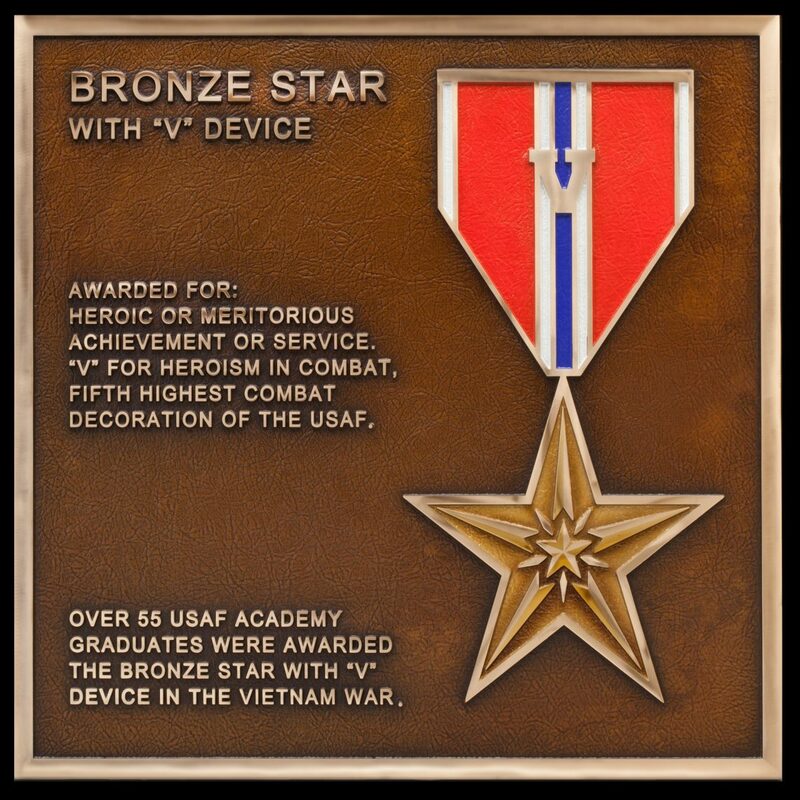 “Bronze Star” with “V” device bronze plaque, designed and cast by sculptor James Nance. 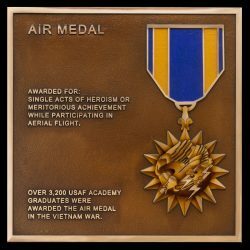 Awarded for: Heroic or meritorious achievement or service. 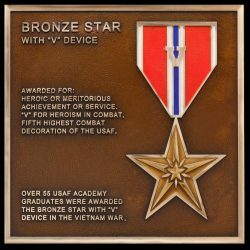 “V” for heroism in combat. 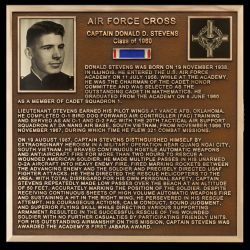 Fifth highest combat decoration of the USAF Over 55 USAF Academy graduates were awarded the Bronze Star with “V” device in the Vietnam war. 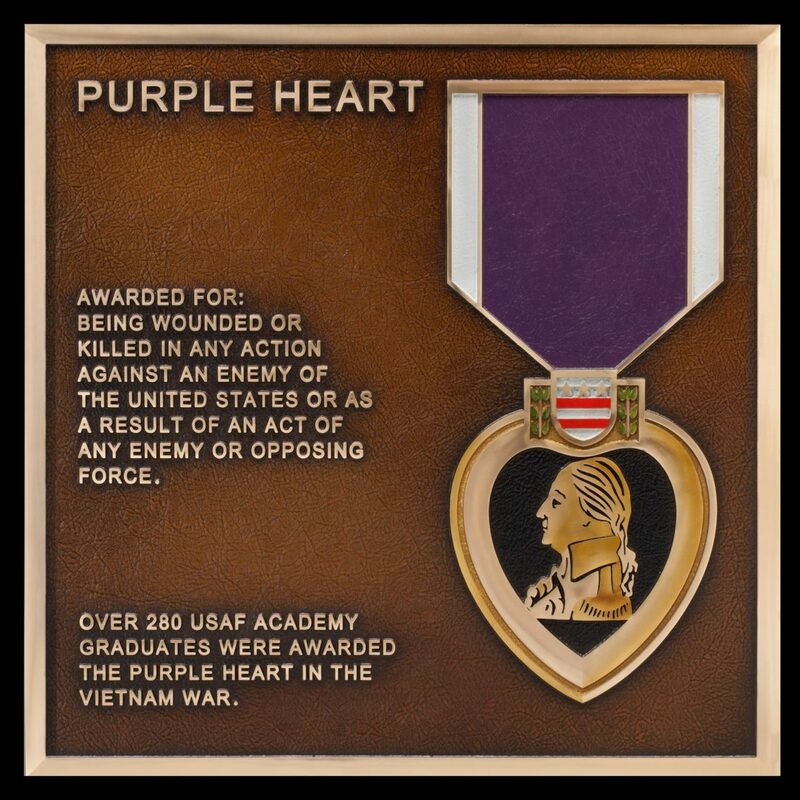 "Purple Heart” bronze plaque, designed and cast by sculptor James Nance. 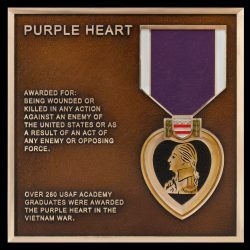 Awarded for: Being wounded or killed in any action against an enemy of the United States or as a result of an act of any enemy or opposing force. 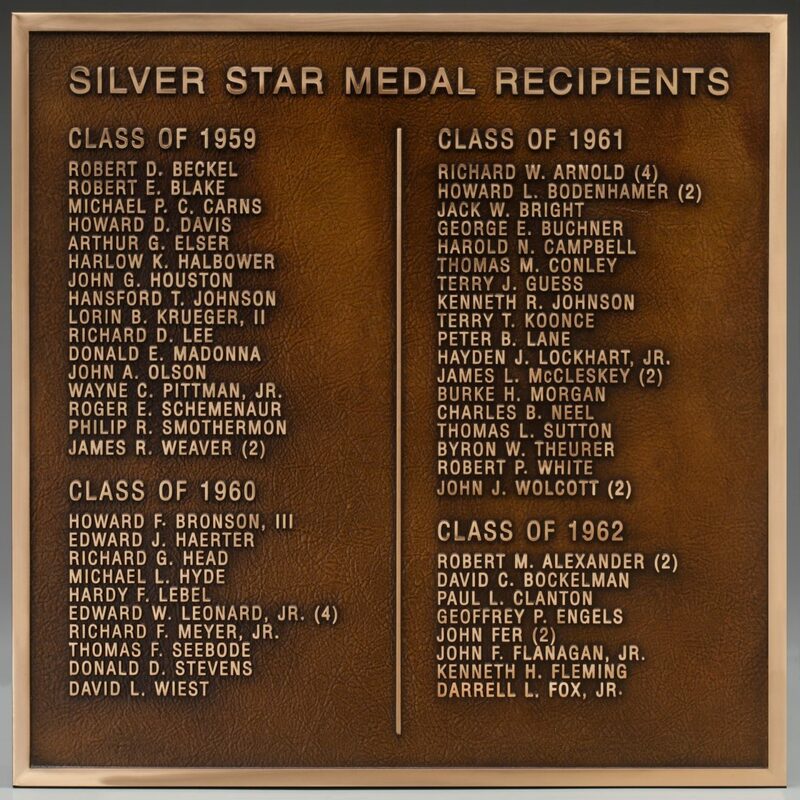 Over 280 USAF Academy graduates were awarded the Purple Heart in the Vietnam war. 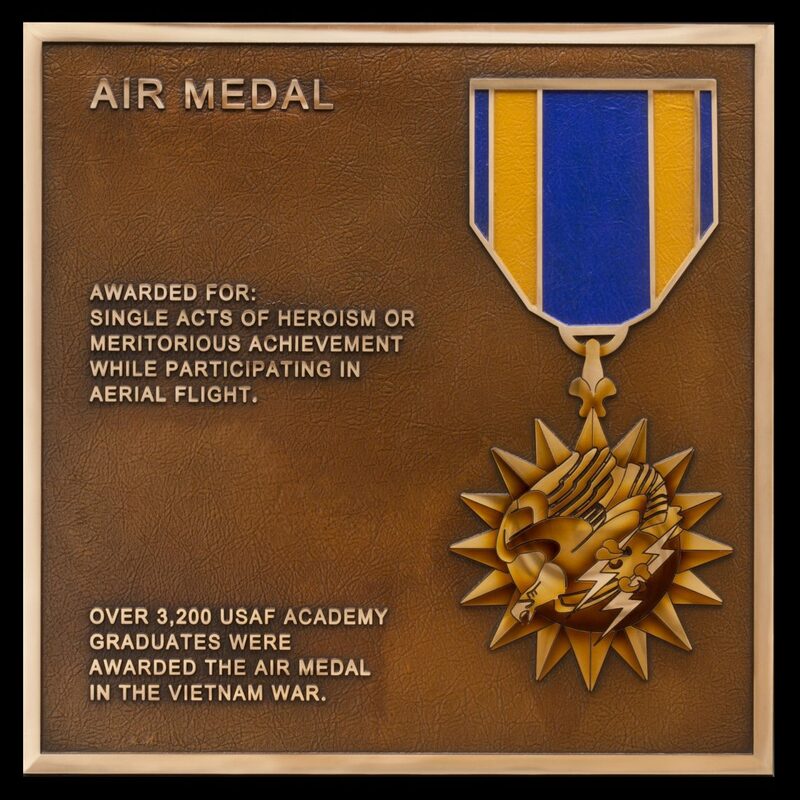 “Air Medal” bronze plaque, designed and cast by sculptor James Nance. Awarded for: Single acts of heroism or meritorious achievement while participating in aerial flight . 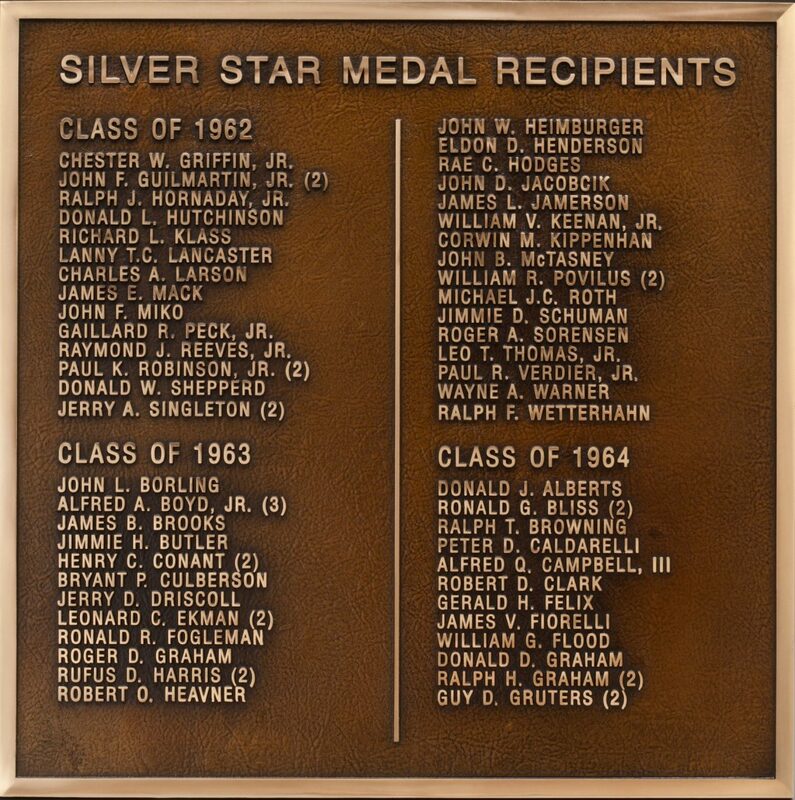 Over 3,200 USAF Academy graduates were awarded the Air Medal in the Vietnam war. 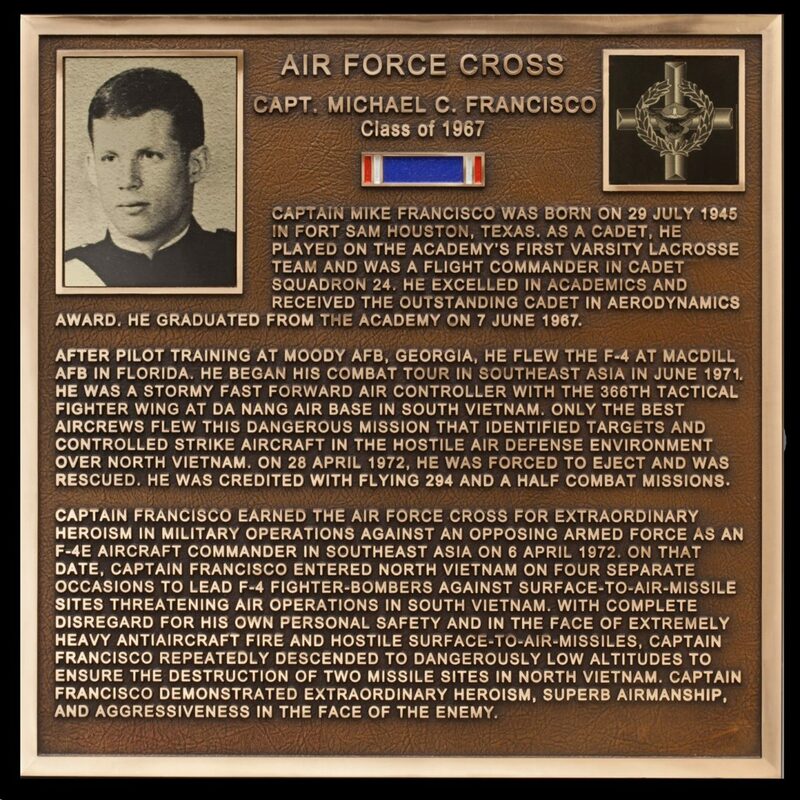 Air Force Cross bronze plaques designed and cast by Sculptor James Nance. 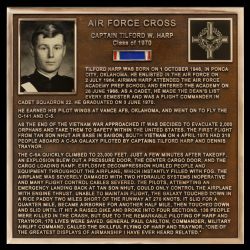 Awarded for: Extraordinary heroism while engaged in an action against an enemy of the United States. 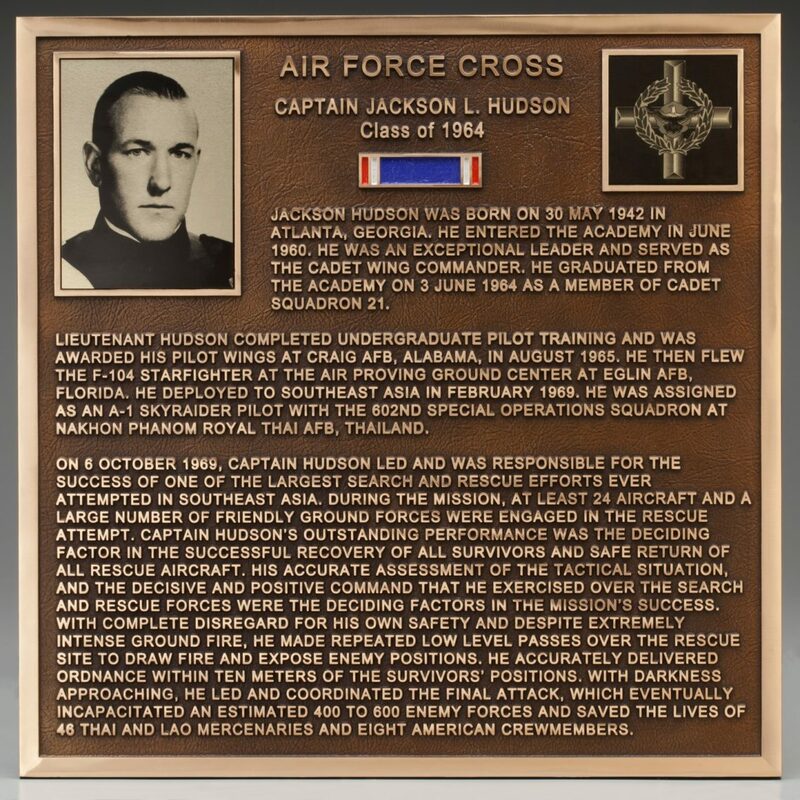 Highest medal of the USAF after the Medal of Honor. 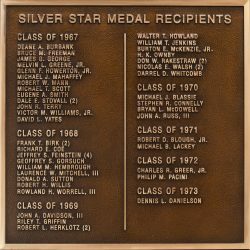 These 16 plaques are displayed on the West wall of the Plaza of Heroes at the Vietnam Pavilion at the USAF Academy. 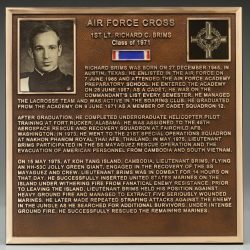 The following sixteen USAF Academy graduates displayed alphabetically were awarded the Air Force Cross in the Vietnam war.